Free Shipping Included! CREATIVE ART MATERIALS Caran D'ache Luminance Colored Pencil Sets Set of 80 Wood Box (6901.476) by CREATIVE ART MATERIALS at Stickman's Blog. MPN: 6901.476. Hurry! Limited time offer. Offer valid only while supplies last. The Caran d'Ache Luminance 6901 76 piece colour pencil set is a combination of the highest lightfastness and the smoothness of a permanent lead. 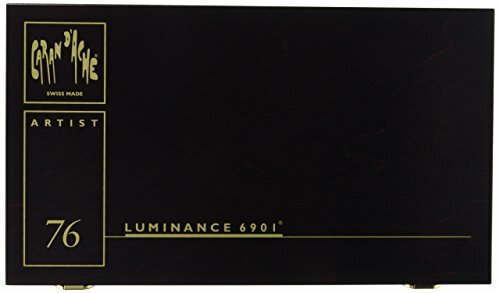 The Caran d'Ache Luminance 6901 76 piece colour pencil set is a combination of the highest lightfastness and the smoothness of a permanent lead. Every shade has been formulated using finely-ground pigments chosen for their purity, intensity and resistance to UV. Colours can be blended, burnished and layered on a variety of surfaces. Also included are 2 Full Blender-Bright Sticks to allow for the blending of colours, 2 Grafwood graphite pencils and duplicates of 4 colour pencils. This assortment comes in a handsome wood box, making it an ideal gift. If you have any questions about this product by CREATIVE ART MATERIALS, contact us by completing and submitting the form below. If you are looking for a specif part number, please include it with your message.